Here’s a tale from ancient days starring Bill Sienkiewicz. I’m sitting at my desk at Marvel one day, doing Editor-in-Chief stuff, whatever, and the phone rings. The receptionist asks me if I will take a call from someone named “Neal Adams.” Who? Yes, I will take a call from Neal Adams. Kidding. What?! Of course I was interested. Neal sent him over. This guy, Bill Sienkiewicz, turns up and shows me his samples. He drew like Neal Adams. And I know Neal’s work well enough to see that the samples weren’t swipes. I had doubts nonetheless. But Neal wouldn’t be sending me a swipe artist. So, he drew like Neal Adams. I was not going to let this guy leave without an assignment. I wanted him drawing for us, not traipsing around the city looking for work at other places. I scoured the joint for a script or a plot. Nobody had anything for Bill to draw. So, I dug out a script that had been scrapped, because we didn’t like it. A Satanna story, I think. We thought it was unusable. Dead inventory. I told Bill it was an important project that he was perfect for. Sent him off to draw it. By the time he came back with that job, I had real work lined up for him. P.S. We used that job! I think it was part of a mini-series that Bill ended up drawing. After he drew it, it suddenly didn’t seem so bad anymore. P.P.S. One time he came into the office to deliver something and that day I needed a cover drawn in a hurry. I asked him if he could draw it on the spot. He agreed. We found him a table and some tools. A couple of times as he was drawing, I peered over his shoulder and watched. One of the most amazing things I ever saw was Bill drawing. So effortlessly brilliant. Wow. P.P.P.S. Neal wasn’t doing much in the way of comics back then. Once, at a Chicago Con, shortly after a rare piece of Neal’s work came out—a cover, I think—somebody in the audience at a panel asked me who this “Neal Adams” guy was, and why he thought he could get away with copying Sienkiewicz’s style. Bill obviously liked Neal’s stuff—who didn’t?—and followed his lead. I encouraged him to be himself, but I think he worried about doing a different style. One day he came to my office with a Moon Knight job he’d just finished. He seemed nervous about showing it to me. Thought I wouldn’t like it, because he’d moved away from the Neal-inspired style to something different. It was amazing. And I told him so. He seemed pleased. Then, he just busted loose. Wow. Revolutionary. Crazy, sometimes. But genius. Chris Claremont wanted to work with him on New Mutants. I knew that meant throwing down all rules, boundaries and occasionally common sense sometimes and dancing upon them, but, hey, we were Marvel Comics, and if we weren’t willing to experiment, who would? Young people learning the trade I made follow the grid, do the basics till they learned. But once a person showed chops like Bill had, or Miller had, the smart play was to let them go invent. And they did. In 1986, Marvel’s 25th Anniversary year, I arranged for every single Marvel editor to go to the San Diego Comicon. I pitched this to the Con organizers: “Use this for publicity. Every single person authorized to buy creative work from Marvel will be there to look at samples. Tell everybody to come and show their stuff.” I also told them that we’d be doing publicity stunts to help get news coverage. If you do a publicity stunt in an attempt to promote a commercial enterprise the news media will ignore you. But, since the events were planned to promote the cultural-event Con (and, oh, by the way, Marvel), there was a good chance that we’d get some publicity. Bill wasn’t invited to San Diego that year, but wanted to go. Bill was athletic—probably still is, I haven’t seen him for a while—and just the right size for the Spider-Man costume Marvel used for its character public appearance program (things like the annual Easter Egg Roll on the White House lawn). I told Bill that if he’d wear the costume for a few events, Marvel would pay for the trip, all expenses. Save him significant dough. He agreed. So we went and tried to get some attention. I brought a professional photographer along. The Con organizers ignored me. No attempt to get publicity whatsoever. Screw Marvel and its 25th Anniversary. Because we were successful? Or was it something I said? Bill, in costume, had his picture taken in the plane. We went to the beach and did a photo shoot with a pad on an easel in the shallow water and with all of us with our pant legs rolled up, standing in the gentle surf—an “editorial meeting” for a promo photo for the upcoming Sub-Mariner limited series. Bill was in costume. On the way there, the police pulled us over—because they saw Spider-Man in one of the convertibles! Bill had his picture taken with the cops, sitting on one of their motorcycles. We rented tuxedos for everybody. Louise Simonson looked spectacular in a tux. Mark Gruenwald cleaned up real nice, too. Who’dathunk it? I looked like a gawky groomsman. Then we all went to Seaworld to have our pictures taken in the penguin building to promote the upcoming Iceman limited series. I had previously arranged this stunt with the Seaworld PR people. They told me to ask the gate guard to call them when we got there. Seaworld reneged. The gate guard called the PR office, said “uh-huh,” and told me that they had instructed him to make sure we all paid full price to get in. When we got to the penguin building, we were refused entrance. We were told that we might disturb the penguins. Okay. Maybe 14 or 15 people in tuxes, plus Spider-Man (Bill) and a photographer might upset penguins. Dunno. So we had our picture taken outside the penguin building by the sign. As we were leaving the park, word had apparently spread that SPIDER-MAN was in the park! We were MOBBED! Seriously, an amazingly large crowd surrounded us, and by us, I mean Bill. I never before noticed so many Spider-Man tee shirts, but there were hundreds of them. Hundreds. No exaggeration. Bill started performing. Bill, to my knowledge and experience to that point, was a pretty shy and quiet guy. Not one for snappy patter. But, with the costume on, he WAS Spider-Man. Far better than any actor who’d ever worn that costume. Bill was jumping around. Striking Spider-Man poses. Laughing, joking, daring. Making wisecracks. In perfect character. Doing backflips off the top, the TOP, the backrest of a bench! No prior gymnastics experience as far as I know…. The crowd, already huge, grew exponentially. Finally, the only way we could escape was for Bill to duck—make that leap, cartwheel, tumble—into a men’s room and change into his secret identity! As we were leaving the park, the entire Seaworld management staff came running—RUNNING—after us, pleading with us to come back. I told them to go to hell. We also went to Disneyland. I don’t think Bill was in costume for that one. Might be wrong. Dunno. Had our pictures taken with Mickey and Minnie. Ask Bill, Louise, Larry Hama…. Crazy stuff, but fun. I don't remember whether or not the Comic Scene cover is related to that inventory story, sorry. It's a nice shot of Cap, though. Thank you very much for the behind-the-scenes stories like this one, which is rich! Could be related to this cover published in Comic Scene in 1982? Although I enjoyed his Moon Knight stories included in the Hulk mag and in his own magazine which was published till issue #20 in Spain (hence I lost the age where he exploded artistically, around the "Hit it" story), my mind got blown away with New Mutants #18. This issue marked me in my teens, and I'm a fan since then. Right now I am extremely lucky to own some of his original art, which includes the painting published in NM #21, another issue which left a big mark on me. When Sienkiewicz premiered on New Mutants, I hate hate hated it. I found it very hard to process the art, figure out who was who and what was going on. By the end of the Demon Bear story, though, I had to admit that the art worked really well for the story, and I was acclimated by then. Love love loved it after that. Sienkiewicz is also a great inker, his work over Sal Buscema's pencils in Spider-Man was fantastic, he gave the book a raw energy. I had read that Bill and Neal had a little exchange which resulted in Neal saying something to the effect that Bill draws like him. I can't remember the details but I think Bill was poking fun at Neal (possibly with a sketch involved)and Neal's reply was "but you draw like me". Someone cited that exchange as the turning point in Bill's art style. I finally got an opportunity to meet Neal at Dragon Con and have him do a sketch based on a picture of the girl I date. I met Bill a few months later a Wizard's Atlanta show and almost had him do a sketch of her also. I ended up leaving the show early and not going back. I'd still love to have him do a sketch, but it doesn't look like it'll happen anytime soon. Sienkiewicz just has incredible talent. He can throw down a few scribbles and capture the essence of something in a minimalist kind of way. Toth is another artist that had that ability. For a story, I prefer it when Sienkiewicz draws a tightly rendered "clean" product, but his sketchy pieces can still be stunning. Ah, yes, I'm aware of the broken hand incident and the results. However, I'm talking about an earlier time, when Bill completely changed his style while working on Moon Knight. I was told by a "in the know" comics dealer back in the 90's that the artwork Bill Sienkiewicz did on New Mutants was because he had broken his drawing hand and the New Mutants artwork was from his off hand. A few years later I had the opportunity to meet Bill Sienkiewicz at San Diego Comic Con and asked him about it. He pretty much said the same thing that Jim talked about above, but he also mentioned that any good artist continues to grow & change through out their career. I must say he was one of the most down to Earth people I have met in the industry. Yep. Now that you mention it, it comes back. I was guessing that such a special event had to be for the 25th Anniversary, but, no, it was, of course, in the year that we did Assistant Editor's Month — which was applauded tremendously and reviled tremendously. Thanks. I second the call, anybody got photos of Bill as Spiderman. Would love to see. Bill Sienkiewicz is an extremely talented artist. Thank God for "Cut and Paste" and the internet or I'd never get the spelling of his name correct. I believe the Spidey/Bill stories happened during the 1983 San Diego Comic Con. It's the year that Marvel held its infamous Assistant Editor's Month. Jim, you chronicled the events of that Summer over two installments in the Bullpen Bulletins page and there's a B&W pic of Bill as Spidey in there as well. The Sub-Mariner and Iceman minis were released the following year. It's fun stuff! For anyone who wasn't around back then, go check out Jim's columns from that era. Marc said it: "Sienkiewicz opened my eyes to new ways of doing comics. I thank you for giving him a chance to let loose." His work was and still is unlike anything ever done in comics, and his work on Elektra Assassin took Miller's excellent story to a place it could never have gone without Sienkiewicz's art. You actually wrote this up in one of your Bullpen Bulletins a couple months after it happened. You made it sound like Spiderman's identity was secret until he signed an autograph for a fan as Spiedierman !! LOL ! I read a blog recently where the writer was pinning over the good old days when the big two would let people like Bill strut his experimental stuff. It's nice to hear the back story on it. I thought Bill passed his art work under the radar. I Hadn't realized that he was actually encouraged by "the management" to break loose. Great story Jim! 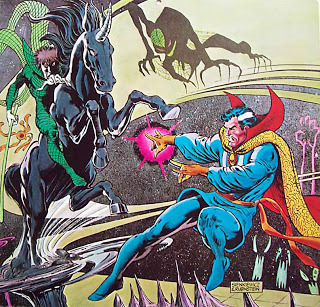 Bill S., Frank Miller, John Byrne… — they all started as guys who drew like Neal Adams. It's interesting to see the direction each took as they became themselves. Anyone reading this got any of those photos? Do you, Jim? It would be great to see them. I was regularly buying NEW MUTANTS back in seventh grade. More for the story than for the artwork which was solid but conventional. Nothing wrong with that at all. But then came Sienkiewicz. BOOM! Never seen anything like his art before … or since! I had read his FANTASTIC FOUR #223 four years earlier, but he had gone from good to great once he developed his own style. Can't imagine the Demon Bear and Warlock stories told any other way. A couple of years later, Sienkiewicz was the first comics pro I ever saw in person. He was a guest at a Hawaii con I attended – either my first or second. And a couple of years after that, I was stunned by ELEKTRA: ASSASSIN. A generous friend lent his set to me and I reluctantly returned it to him. Eventually I got the TPB. 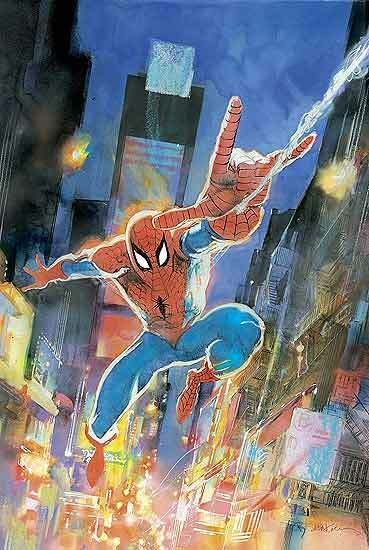 Sienkiewicz opened my eyes to new ways of doing comics. I thank you for giving him a chance to let loose … and for giving him the Spider-Man costume. You told the most AMAZING improv story I've ever heard! If I put on a Spider-Man costume, I'd just hurt myself! PS: Does anyone know where Sienkiewicz's Satana story was printed? The closest thing I know of was a Lilith story printed in the final issue of the TOMB OF DRACULA magazine. PPS: You mentioned the Sub-Mariner (1984) and Iceman (1984-85) miniseries. (The dates make me wonder if the con you're talking about was in 1984, not 1986.) These two were among a bunch of solo hero miniseries during this period: e.g., HAWKEYE, FALCON, and HERCULES. Were these intended to be tryouts for solo regular titles? And/or contribute to the effort to generate cash to fund the anti-takeover battle against Mario Gabelli? PPPS: Since I just mentioned the Falcon … I was looking at the splash you drew for FALCON: KNIGHT OF THE QUEST in 1967 and was wondering what you had in mind if you had been able to continue. Ditto for the BRIMSTONE strip you co-created with Bill Schelly from the same period. Great story… as a kid I started collecting/reading in the very late 70's. That's when I started noticing artists names. I found a copy of the Marvel Preview Magazine #21 featuring the Moon Knight, and loved the artwork. Looked up his name realized shortly afterwards that he was working on the FF. Then of course I was one of those kids that went crazy for the Moon Knight series when it came out. I then saw some of Neal Adams artwork and made the same assumption that the kid in your story did. Luckily someone set me straight before I embarrased myself in public.